March 2010 is an odd little month, with two big, family-oriented blockbusters bookending an otherwise frankly second-tier batch of releases (at least when it comes to box office - and does anything else really matter?). Although you never know about some of these titles - as we have all learned this past year, the box office can come up and bite you on the bee-hind when you least expect it. Yet another chapter in this year's cinematic showcase of various mythological beasties, this one courtesy of DreamWorks and the co-directors/writers of Lilo & Stitch. The voice cast matches Gerard Butler with some of the Apatow regulars (Baruchel, Wiig, Mintz-Plasse), and adds Craig Ferguson in for good measure, too. It's a combination that's evidently so intimidating that even Clash of the Titans delayed its release for a week, apparently fleeing with its tail between its Kraken's tentacles. Look, I'll be honest here - these CGI movies all look just about the same to me; they all get praised incessantly and make a ton of money, and have little to no discernible effect but the monotony of having to observe them do it. 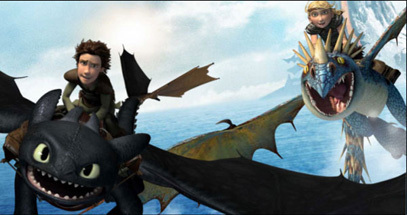 Indeed, How to Train Your Dragon is obviously being set up as the first big CGI hit of 2010, so who am I to deny that this will invariably be the case?